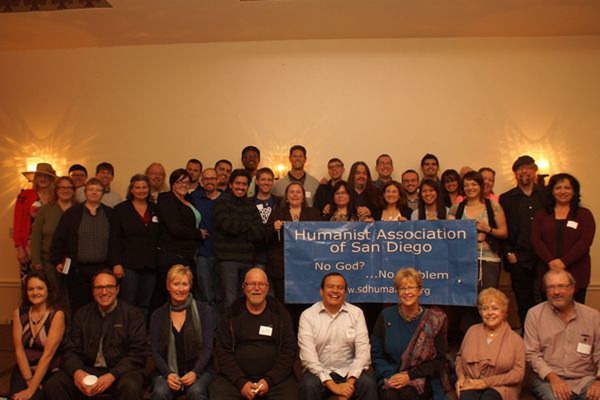 We are the Humanist Association of San Diego, a community organization that promotes humanist philosophy & values, the separation of church and state, and cilvil rights through discussions, lectures, outings, and community service events. We have been active since 1970, and a proud chartered chapter of the American Humanist Association since 1973. Please click on the title of the event to be directed to our Meetup.com page location and other details will be available there. Then on the third Sunday we will meet to discuss Inherit the Wind. We haven’t updated the site in a couple of months (most of our group’s correspondence is on Meetup). But for December we are going to be having our weekly current events discussion group at Panera Bread in Hillcrest (check meetup), on the 9th we are going to have a discussion on Women in Islam, and celebrating HumanLight on Sunday December 20th at the Joyce Beers Center in Hillcrest. We will be updating the page for our 2016 plans and schedule. July 1st (Wednesday): Cards Against Humanity Pizza Party. One of our group members that was highly active until she moved away is back for a visit. Please join us at a “Cards Against Humanity” Pizza Party. We are celebrating her San Diego return, Shelayne (“think shell with a brain”) Nicole will be here. As the title says, we will be having a party that Shelayne will be at and there will be people playing Cards against Humanity. Also please RSVP so we know how much pizza to get, also bringing a snack/ (adult) beverage to share is encouraged. July 4th (Saturday): Independence (from Dogma) Day Party & Fireworks Show. Every year, we get together for the best seat in the house for Sea World’s fireworks display. At Mickey’s shop (Crack in the Wall Framing) there is a large parking lot with plenty of available parking, and a great vantage point to watch the show. As the Fourth falls on a Saturday, we will be holding Coffee & Conversation at Crack in the Wall at 6. This will be a potluck dinner (please list what you would like to bring in your RSVP), and then we will hang out to watch the sky light up in patriotic delight. July 9th (Thursday): “The Politics of Sin in American History,” a topic and book discussion of James Morone’s Hellfire Nation. ***we had to reschedule from Wednesday to Thursday-sorry for the inconvenience. July 11, 18, & 25th (Saturday): Coffee & Conversation. July 19th (Sunday): Humanism & Human Rights. August 1, 8, 15, 22, 29th (Saturday): Coffee & Conversation. August 5th (Wednesday): “An evening of basic stats for not statisticians,” an overview of basic descriptive and inferential statistics-and a discussion of Nate Silver’s Signal in the Noise. ROY ZIMMERMAN: THE FAUCET’S ON FIRE! What can one person do about climate change, torture, racism, gun violence, fracking, Congressional ineptitude, ignorance, war and greed? Write funny songs, says Roy Zimmerman. “The Faucet’s on Fire!” is ninety minutes of Zimmerman’s hilarious, rhyme-intensive original songs. His songs have been heard on HBO and Showtime. He’s shared stages with Bill Maher, Robin Williams, Ellen DeGeneres, John Oliver, Kate Clinton and George Carlin. He’s been profiled on NPR’s “All Things Considered,” and he’s a featured blogger for the Huffington Post. Tickets are available at the door ($15 general, $10 student). “Humanism is a progressive philosophy of life that, without supernaturalism, affirms our ability to and responsibility to lead ethical lives of personal fulfillment that aspire to the greater good of humanity” (preamble to Humanist Manifesto III). “Humanism is the Joyous Service for the greater good of all humanity in this natural world and advocating the methods of reason, science, and democracy” (Corliss Lamont , The Philosophy of Humanism). The Humanist Community is a broad umbrella covering Agnostics, Atheists, Deists, Ethical Culturists, and those of a liberal-progressive secular-religious tradition who come together to use our creative, intelligence, and experience; guided by compassion to make this world a better place, and to become better people in the process, together. We Humanists place our concern in this world, united by our love of humanity, and driven by our ever present optimism in our ability to improve the human condition.